New Orleans can't keep all its assets completely to itself, sometimes the rest of the world needs a little NOLA in it as well to shake things up a bit. And New Orleans native, Irvin Mayfield, is doing exactly that for Chicago later this month. The Grammy winning New Orleans Jazz Orchestra(NOJO), lead by Mayfield, has a mission to "...inspire freedom and culture in the individual and the global community by creating authentic, engaging jazz experiences that celebrate the origins and transform the future of jazz. "NOJO's vision is to enhance every day of life with jazz. And come November 21, every day life in Chicago will be enhanced with some stellar jazz from the Big Easy. 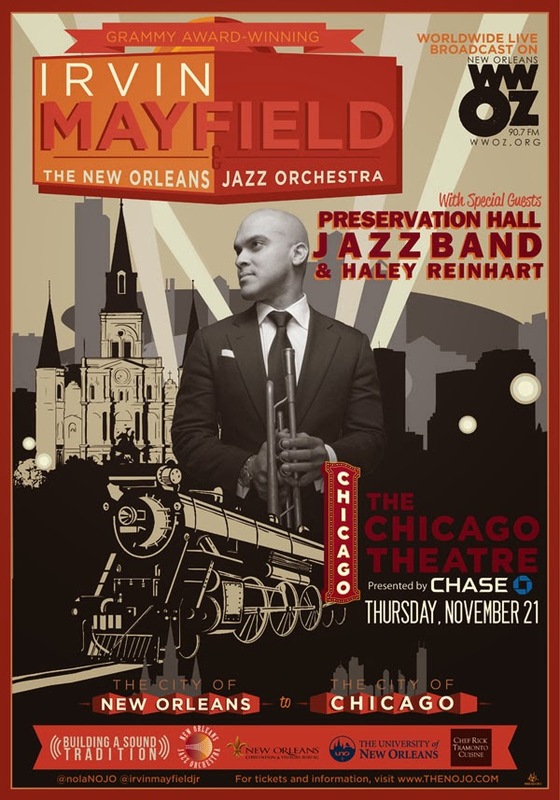 Irvin Mayfield and the New Orleans Jazz Orchestra will bring an elegant New Orleans soiree to the majestic Chicago Theatre. Music lovers familiar with the New Orleans Jazz Orchestra's award winning release, Book One, already know just how magical of a show this is going to be. Joining NOJO will be the Preservation Hall Jazz Band and Allen Toussaint, also from New Orleans, and joined by Chicago's own Kurt Elling and Haley Reinhart. For those who live in, or are dropping into, the Chicago area - come experience New Orleans jazz at it's finest - live and in person. The Chicago Theater is located at 175 N State Street in downtown Chicago.